So, June ended when I wasn't looking. That means that 2014 is half over?! When did time decide to start moving so damn fast? Probably when I turned 40. How was June for you? Did you read anything amazing? Did you read something I should avoid like the plague? Let me know in the comments. So glad to hear you're loving what you're reading (and tossing what you aren't!). I really want to hear more about Goat Mountain - was it as gruesome as everyone said? Good month! A couple of those I wanna read! Interesting list you have there. Is it sad that I haven't heard of any of these books? Well if you ask me your quantity is just fine, as my June is even less quantifiable. I want to read California. And I feel like time is passing quickly, too. I'm 34, my bf is 48 and he says hold on because you blink and it's been half a year. I'm like oh no. Your quantity is my entire year ;) But yeah, quality counts. 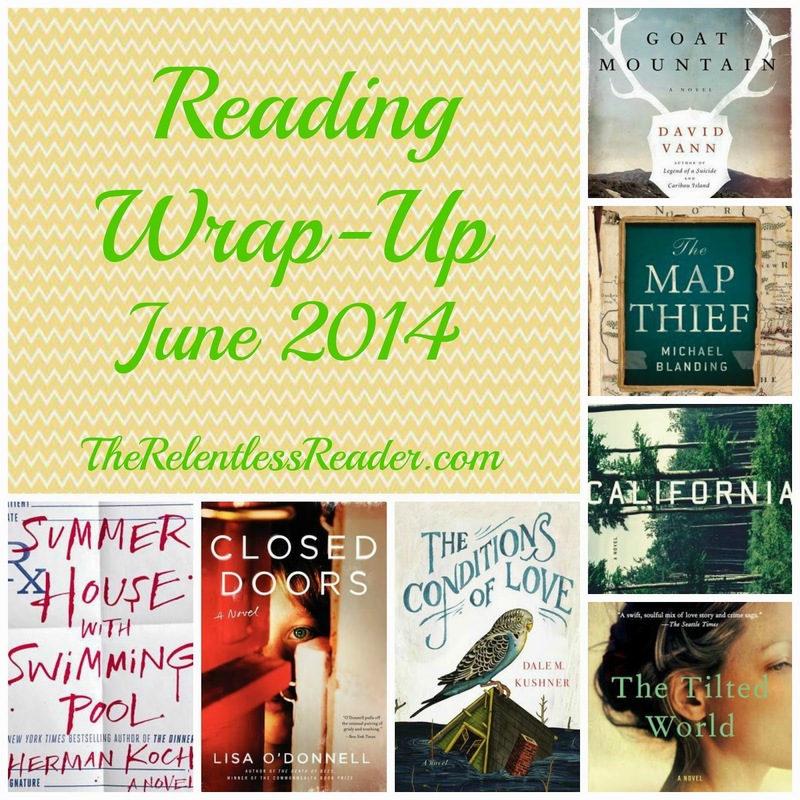 I've got Summer House and Map Thief on my TBR. Amazing? I keep saying Belle Cora by Phillip Margulies. I think I said it here before? Or maybe not. I'll say it again then -- it's an awesome historical fiction piece about a high class prostitute. Quality definitely trumps quantity! I'm interested in the new Koch. My sister is reading The Dinner and loving it so I've told her there is a new one coming. Much excitement all round! I would love to read a review on California! I've seen it around a bunch, but haven't seen that many actual reviews. I also read Summer House with Swimming Pool this month and will be posting my review next week. It was hit or miss for me, but I'm still planning to read The Dinner. Woo hoo! You had a great month! Quality is aways better than quantity! I can't wait to hear what you thought of The Map Thief. I just finished it myself. Screw the challenge. Sorry but I let it get to me last year and now, not so much. On a much happier note in June I had one of those months where I thought I should stop reading forever because the odds on finding such amazing books again are...none. They are: Mambo in Chinatown, Everything I Never Told You and Above the East China Sea. Loved them to pieces. Did my comment vanish? Sad. Stupid challenge. You've got THINGS GOING ON. And, shoot, you're still reading a crap ton compared to mere mortals. Congrats on doing well with your challenge!